Over the last two decades, the once small border town of Shenzhen has experienced a massive boom, transforming it into a pulsing, restless metropolis. The Shenzhen Special Economic Zone was founded in the 1980s a city open to foreign investment and built practically from the ground up by many former Hong Kong residents. Most Chinese moving to Guandong province are heading to Shenzhen, to seize a multitude of new opportunities. 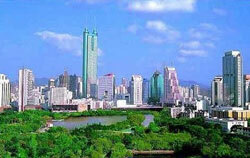 Shenzhen’s infrastructure has been vastly improved, and it is becoming one of the most modern cities in the region. Shenzhen has long had a bad reputation as a practically lawless cowboy town, with a disreputable stock exchange, an over-active nightlife, a thriving black market selling pirated versions of every product you can think of, and a vulgar glitziness brought by new money. The city’s theme parks, for one, are testament to the latter. Windows of the World, for example, has replicas of over 130 well-known sites, from the Eiffel Tower to Egypt’s pyramids. You can visit them all in less than an hour, and without needing a passport! For while Shenzhen lacks the natural scenery and historical allure of other great cities in China, it has compensated by building flashy, attention-getting attractions. Other attractions include Splendid China, Chinese Folk Culture Villages, Evergreen Resort, Wild Animal Zoo, Yinhu Resort, Honey Lake Holiday Village, Fairy Lake Botanical Gardens, Xiaomeisha Beach Parks and Guanlan Lake Golf Resort. These lure thousands of tourists from China and abroad every year. Those looking for calm can visit government-built areas such as the Shenzhen Xianhu Botanical Garden, Shezhen Safari Park, or Xili Lake Resort. The weather in Shenzhen is generally pleasant. Though occasionally hit by typhoons during its hot but wet summer, the temperature hardly reaches over 35 degrees Celsius. Shenzhen is comprised of the following areas: the districts of Nanshan, Futian, Luohu and Yantian located in the Special Economic Zone, and the districts of Bao’an and Longgang outside.